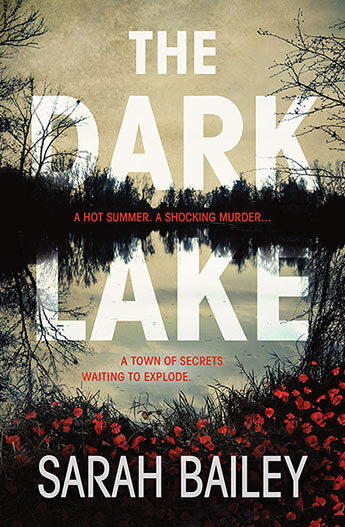 Sarah Bailey’s acclaimed debut novel The Dark Lake was a bestseller around the world and Bailey’s taut and suspenseful storytelling earned her fitting comparisons with Gillian Flynn and Paula Hawkins. 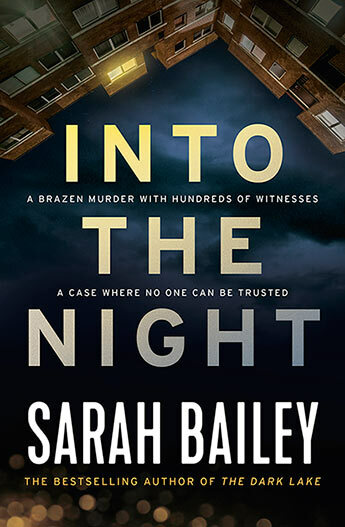 Into the Night is her stunning new crime novel featuring the troubled and brilliant Detective Sergeant Gemma Woodstock. This time Gemma finds herself lost and alone in the city, broken-hearted by the decisions she’s had to make. Her new workplace is a minefield and the partner she has been assigned is uncommunicative and often hostile. When a homeless man is murdered and Gemma is put on the case, she can’t help feeling a connection with the victim and the lonely and isolated life he led despite being in the middle of a bustling city. DS Gemma Woodstock has decided in a sense to put her career before her family. Leaving her young son with his father, Gemma has moved to Melbourne to straighten her life out and to put her career back on track. This is a far from standard Australian police procedural becoming extremely complex when a popular young tv star is murdered during the shoot for a zombie movie filmed in Spring St. Melbourne. There is literally a cast of thousands, and although they have the film footage it is very difficult to see exactly when Sterling Wade was stabbed and exactly who stabbed him. This is Gemma’s second case in her new posting. The first was the murder of a homeless man, also stabbed, in a laneway.The pathologist’s report suggests that the two murders are surprisingly similar but the investigating team can’t connect the two victims. The action moves at a good pace, and the stresses in Gemma’s new life are well described. A hot summer. A shocking murder. A town of secrets, waiting to explode. A brooding, suspenseful and explosive debut that will grip you from the first page to the last. table. Glassy eyes fixed blindly on the ceiling. She was still so beautiful, even in death. time before breathing deeply, readying myself, letting her pull me back into her world, and I sank down, further and further, until I was completely, utterly under. But that’s not all Gemma’s trying to hide. As the investigation digs deeper into the victim’s past, other secrets threaten to come to light, secrets that were supposed to remain buried. The lake holds the key to solving the murder, but it also has the power to drag Gemma down into its dark depths. Gemma Woodstock is a Detective Sergeant in the town she grew up in. Rosalind Ryan has recently returned to Smithson to teach in the high school she once attended. When she is murdered shortly after a performance of Romeo and Juliet at the school, Gemma’s boss questioned whether there was a conflict of interest in her being involved in the investigation. But she assures him that there is no question about that – her special knowledge of the town and its people will be invaluable. She and Rosalind were in the same class but that was all. Gemma obviously believes that being involved in the investigation will give her an edge in solving the murder, as well as keeping elements of her own past hidden. There is at least one big secret that she doesn’t want anybody to know. The author uses a time frame device to reveal snippets of the past, generally labelled “Then”, alongside carefully dated chapters (together with times) to encapsulate the present. I am never sure when we have carefully labelled time episodes whether I have got the timeline right in my mind. I find myself hoping the author hasn’t played a trick on me, put something out of sequence. Her relationship with the deceased is not the only thing that Gemma is trying to hide, but I’ll let you find the rest out for yourself. A good read from a new Aussie writer that I will have to watch out for. Sarah Bailey is a Melbourne based writer with a background in advertising and communications. She has two young children and currently works as a director of creative projects company Mr Smith. Over the past five years she has written a number of short stories and opinion pieces. The Dark Lake is her first novel.